Safety is our number one priority – followed by having heaps of fun! We always look for any potential dangers in the first place and pay constant attention when teaching. The right equipment and knowledge of essential theory are important when surfing. Depending on our guests, the teaching style will vary. For our youngsters, we put a special focus on the fun side of surfing, whereas a workaholic on vacation will get to feel the relaxing side of the sport. An important factor is that we provide the right balance between exercises in and out of the water. Even at home you can prepare yourself for the next surf adventure! We can show you some good exercises to improve your body shape and fitness. In addition you get some dietary advice and a short introduction to self motivation. We will explain the different materials and board shapes to you as well as how to check on your surf equipment before you go into the water. A reminder not to forget to drink enough water and put on enough sun cream. Different dangers may occur in different surf spots. We will give you a spot introduction which will cover wave formation, tides and currents. Furthermore we will explain the different composition of beach and reef breaks. Just as in any other sport, there are some rules you have to follow when surfing. In particular you have to respect the island’s locals, as they share their beaches with us. We will teach you the rules of priority, how to respect the locals and some basic rules when out in the water so that you can communicate with other surfers. Of course it is essential to know how to use your own surfboard correctly when out in the water. 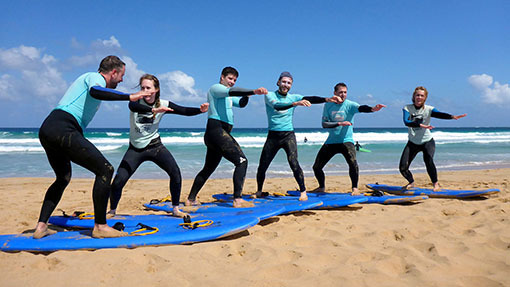 We will explain the best ways to get into the water, how to position your board or how to react when you are about to surf into another person. You have to be concerned about your own safety and the safety of others as well. We will show you what to do when you fall during paddling (hold on tight to the rails of the board) and how to protect yourself when losing control of the board during take-off. It is important always to stay calm and whether it is best to simply dive under the water or cover your head with your arms. It is important that you know how to react in the case of an emergency. Having said that, it is best to remain on your board and stay calm. We will teach you how to behave when stuck in a current or offshore drift and show you the emergency sign, which is to extend your arm straight into the sky.